Eight. Straight. Days. Of. Rain. This is not an exaggeration. We’ve had eight straight days of rain here in Northern Virginia. Not the type of rain that lets up for several hours at a time, thus providing a welcome hiatus. Not the type of drizzle that makes your hair frizz but doesn’t require an umbrella. The type of rain that falls, hour after hour, in sheets. The type of rain that makes even a warm day chilly. 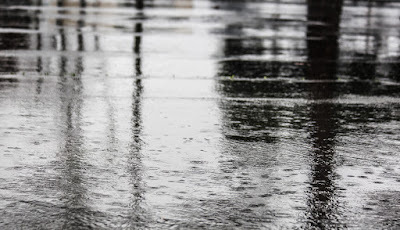 The type of rain that causes your miniature poodle to choose to do her business in the house and face your wrath, rather than brave the elements outside. That kind of rain. Writers are sensitive people. Eight days of rain may make us sad and lethargic, longing for the sun and wishing for its streaming light to flood our writing haven. But it can also be the perfect backdrop for a productive day. Start by pulling on a warm, fleecy sweatshirt and fluffy socks (we all own a pair). Then, go outside. If you have a porch or covered deck, sit. If not, open a window and pull up a chair. Don’t write. Don’t take notes. Sit, watch, and listen. You can hear the rain hit the pavement. See the steam rise from the road. Notice a cat skulking beneath a bush. It catches you watching and darts back into the woods behind your neighbor’s house. The air is cold and your fingertips might turn white, but ignore them. Take a deep breath and let your mind wander to your work in progress, to that scene you want to finish, to that new idea lurking beneath the surface. It’s there – just inside the house – waiting for you. Maybe sit outside a few minutes longer. Maybe get up right now. Either way, choose the right time to make your way back inside and pull up that manuscript. As it loads, pour yourself a cup of tea. Or coffee. Or wine. Take a sip, glance back out at the rain, and relish the silence. If you haven’t already, crack open the nearest window. You may be indoors, but it’s important to embrace the weather. Now it’s time for mood music. You’ll want something mellow to enhance the rainy-day experience. We’ve moved away from sad and lethargic. The rain has created the perfect writing day. Get those tunes going. Find your way back to your characters, to their world. The rainfall comes in droves, now, but you are inside, with your music and the melody of the rain intertwining together. Embrace this calm and the productivity that goes with it. UGH! 8 days of straight rain. That would really get to me!